Anyone can get involved, no matter your level of ability. RivALZ recruits players, super fans, coaches and anyone interested in serving on planning committees. All are welcome! For more information on any of the ways listed below, contact us at RivALZColumbus@gmail.com. To register, visit act.alz.org/rivalzcolumbus. Raise money through donations, in-kind donations, sponsorships, etc. This is for anyone interested being on the RivALZ Columbus team, but does not want to play on Game Day. If you are not interested in playing but still want to get involved, be a volunteer on game day. Game day would not run smoothly without people generously donating their time. 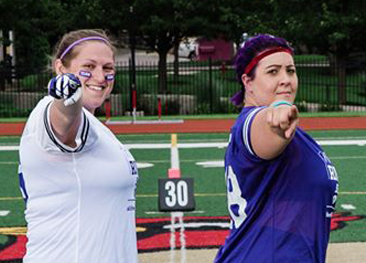 About a month out from game day our Logistics subcommittee will send out an email asking interested volunteers to sign up for specific positions.